Prototype: German Federal Railroad (DB) type WRümz 135 dining car. Crimson/ivory paint scheme. With steeply pitched ends to the roofs, single-arm pantograph, and small roof transformer. The car looks as it did in the winter of 1973. Model: The minimum radius for operation is 360 mm / 14-3/16". The car has an underbody and skirting specific to the car type. It also has type Minden-Deutz heavy trucks with disk brakes and magnetic rail brakes. The 7319 current-conducting couplings or the 72020/72021 current-conducting close couplers, the 73400 lighting kits (2 per car), the 73406 pickup shoe, and the 73407 marker light kit can be installed in the car. A set of decals with car routing signs and sequence numbers for the IC Gambrinus is included. Length over the buffers 28.2 cm / 11-1/8". DC wheelset E700580. 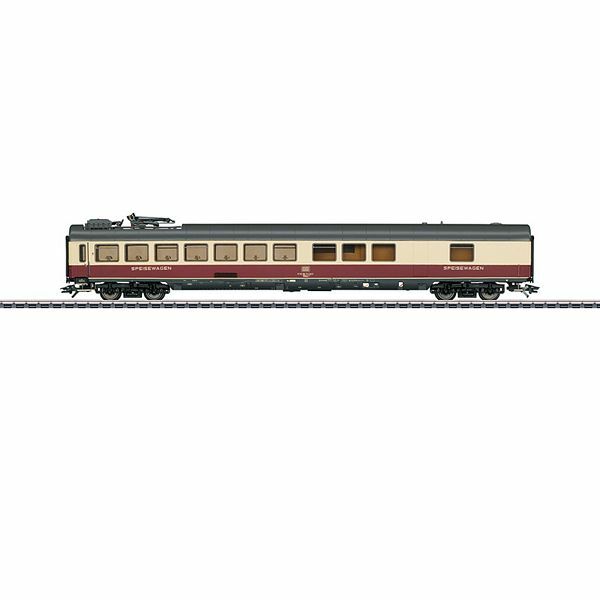 Passenger cars to go with this car can be found in the Märklin H0 assortment under item numbers 43845, 43862, 43863, and 43864. 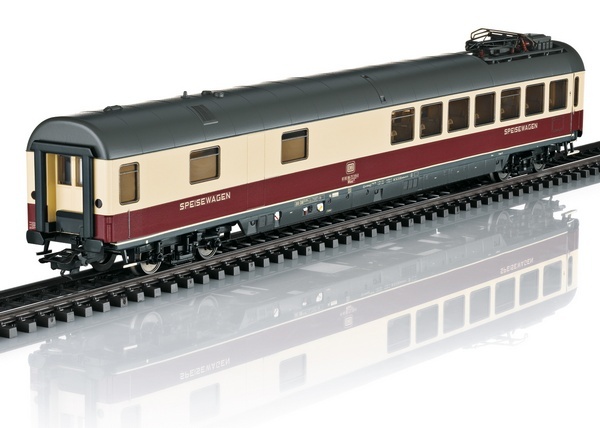 A class 103.1 electric locomotive to go with this car can be found in the Märklin H0 assortment under item number 39150.